This morning’s historic press conference in Washington ushered in a new era of astronomy, in a very exciting way. 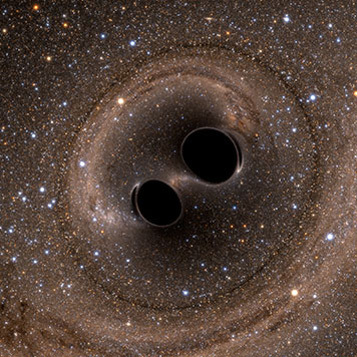 The director of the National Science Foundation, astronomer France Córdova, led the discussion that announced the detection of gravitational waves from two merging black holes, the first such detection in history. Einstein predicted that merging black holes should produce ripples in space-time in his General Theory of Relativity a century ago. And the LIGO project, Laser Interferometer Gravitational-Wave Observatory, made the detection following a generation of effort that went into the search. The detection took place September 14, 2015, and was recorded by LIGO’s facilities in both Livingston, Louisiana, and Hanford, Washington. The detection lasted 20 milliseconds, and suggests the merger of stellar black holes “weighing” about 29 and 36 solar masses, lying some 1.3 billion light-years away, in the general direction of the southern sky, perhaps toward the area of the Magellanic Clouds. LIGO’s Executive Director David Reitze, LIGO scientist Gabriela González, and LIGO cofounder Rainer Weiss of the Massachusetts Institute of Technology also spoke. They revealed that about three solar masses of material from the merging black holes transformed into energy and that the component black holes were about 150 km across before merging. They challenged listeners to imagine something with 30 times the mass of the Sun crammed into that small area, highly energetic and unstable, coming together in a cataclysmic merger. Kip Thorne flatly said that we have observed the universe up until this point as a glassy sea, and have now only seen it in a raging storm for the first time. And he suggested that other such detections should come within a year, and many more with further research and other facilities coming on line in the years to come. It is an historic day for astronomy. Few times in recorded history has the field of astronomy unveiled an entirely new way to see the cosmos. Stay tuned. See a detailed story at Astronomy.com.